We tried…but we couldn’t think of a reason why a good sounding carbon composite bow shouldn’t also be a lot of fun to use! 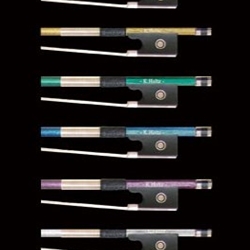 That’s why, after we made sure our K.Holtz Carbon bows had excellent playing and tonal qualities, we decided to offer them in seven brilliant colors. Although their bold appearance was conceived with the student player in mind, we have been pleasantly surprised to hear how popular they have become with professional players as well.